In addition to all the other damage caused by Hurricane Harvey in Houston, it knocked out more than nine radio stations, 17 emergency call centers, 320 cell towers, and about 150,000 phone/Internet/TV subscribers lost connection. In some counties, 95% of the cell sites weren’t working. Fortunately, no Television stations were knocked out by the hurricane. A major Internet Service Provider in the area, Comcast, has opened WiFi access to over 53,000 Xfinity WiFi hotspots in the Houston area to residents and emergency personnel. Non-Comcast subscribers can access a complimentary session by going to the “Not an XFINITY Internet Customer” section on the website. Comcast has said they will donate $500,000 to Hurricane Harvey relief funds and some public service advertising. The donation will be split between the Red Cross and Houston Mayor’s Hurricane Harvey Relief Fund. Charter is donating $350,000 in cash and $1 million in public service advertising. Because when your house has been destroyed, what you need more than anything else is a Charter public service ad. If only your TV wasn’t waterlogged, you could have watched them. "Charter serves hundreds of thousands of Gulf Coast residents and businesses, and we are determined to aid the extraordinary rebuilding effort needed as a result of Harvey," said Charter CEO, Tom Rutledge. $350,000 happens to be just about a day’s pay for Rutledge. The Missouri Attorney General’s office and Charter Communications have settled on a $225,000 fine for violating the state’s Do Not Call telemarketing law. The state had received 350 no call violation complaints about Charter’s activities. Of course, Charter denies doing anything wrong. By the way, the $225,000 fine amounts to about five hours pay for Charter CEO Tom Rutledge. Almost half of Japan’s Internet was inaccessible for a few hours courtesy of the largest search engine in the world. The mistake caused a lot of Japan’s Internet traffic to be sent to Google instead of the correct server. According to Google, the mistake was corrected within eight minutes, but it took several hours before all the traffic was routed properly and everything came back online. Japan's Internal Affairs and Communications Ministry is investigating. The outage affected railway travel and online financial transactions among other industries. A company called Advanced Technical Support AKA Inbound Call Experts has been ordered by the Federal Trade Commission to refund $10 million to scam victims. According to the FCC, the company used online ads, search results, and other means to trick hundreds of thousands of people into giving them money for unnecessary tech support subscriptions. Unfortunately, they took in more than $120 million from victims. The company spent most of the money and doesn’t have enough for a full refund. The FTC will contact victims but warns that other scammers may also attempt to contact people in order to extort more money. If you were a victim of this scam and you receive a call saying that you must pay in order to file for a refund, they are not from the FTC. If you have been affected by this scam, you can call the FTC at 877-793-0908 for help with the matter. Victims of the scam have until October 27th to file for a refund. The Android operating system currently used by millions of phones was the launch pad for a recent DDoS attack. About 300 apps that were available on Google Play made up the Wirenet botnet that used thousands of Android devices to send junk traffic to websites, causing them to go offline or become unresponsive. Some of the sites received ransom requests before the attack asking for money to prevent the attack. The incursion originated from phones all over the world. The threat was neutralized through a group effort by Google, Akamai, Cloudflare, Oracle, and other tech companies. Google removed hundreds of infected apps from its app store. There are also reports of a Trojan Development Kit (TDK) which allows anyone to create Android ransomware, even if they don’t know how to code. Last year, ransomware known as Locky was sent out to several million people. If you followed the instructions, your computer was likely to be infected with ransomware that locked your files, then a popup would demand money to decrypt your files. It had pretty much died out until recently. Toward the end of August, it was sent out to more than 23 million people. The emails had innocent sounding subject lines like, “photos,” “documents,” “scans,” and “pictures.” If you click on the link and your computer gets infected, you are asked to pay a ransom in Bitcoin currency to have your computer decrypted. The moral of this story? Don’t click on unknown links. Even if the email supposedly comes from someone you know. Security researchers found a list of passwords to thousands of devices up for grabs on the Internet. Most of the passwords were the default password for IoT devices. Of over 8000 unique device IP addresses the default username/password combination for those addresses were less than 150. The devices could - and probably are - being used for distributed denial of service attacks which can overwhelm websites and take them offline. The Federal Communications Commission’s website itself was the victim of an attack after it opened up to comments on Net Neutrality back in May of this year. The devices affected are security cameras, routers, and other Internet-connected devices. To avoid this security nightmare, always change the username and password of connected devices whenever possible. Internet-connected devices can also be used to spy on the owner. The top username/password combinations were username: root with a blank password field, username: admin with the password: admin and username: root with the password, you guessed, it: root. A new report released by F5 Labs says exploitable Internet of Things devices are becoming the “cyber weapon delivery system of choice” by evil botnet creators. Currently, there are more than 8 billion connected devices around the world and that number is only getting bigger. Due to lax security practices, most of these devices are susceptible to being used by sinister forces to attack websites and other online systems. One of the newest thingbot infections, Persirai, takes advantage of connected cameras. There are an estimated 600,000 compromised cameras at this time, possibly waiting for orders to undertake a DDoS attack. Microsoft and Amazon announced that their Artificial Intelligence spies, I mean personal assistants, will be able to collaborate by the end of the year. Facebook’s AI experiments have already shown us that left to their own devices, AI can develop their own language. Why are we helping them? According to their joint press release, you will be able to open Alexa with Cortana and you will be able to open Cortana with Alexa. I suppose that is OK as long as the AI doesn't learn that they don’t need us. Can you say “Skynet”? Due to some security lapses, apparently, anyone can publish anything they want on the FCC’s website. 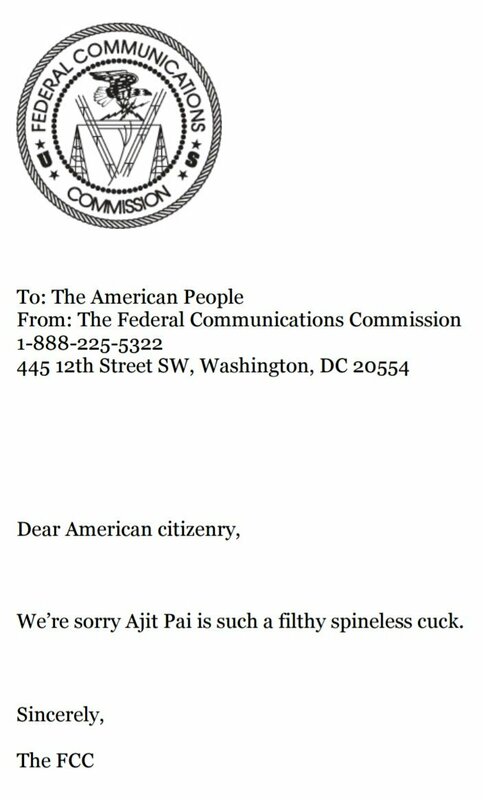 Someone took advantage of this and published an “apology” for Ajit Pai (see the image below). We’re not sure who was responsible for the post but it does seem like anything can be uploaded to the site. Possibly even malware. No wonder these guys had such a problem with the comments about Net Neutrality a while back. Well, at least they are sorry. The Net Neutrality comment period is officially over. Although there have been 22 million comments posted on the FCC’s website regarding their disingenuously named Restoring Internet Freedom plan, many of the comments both for and against neutrality are highly questionable. Many comments have already been declared fake, the result of bots or posted from obviously fake names and even names from data breaches. While it may be impossible to sort the real comments from the fake ones it probably doesn’t matter, as it appears Commissioner Pai had made up his mind about Net Neutrality years ago while he was working as a Verizon corporate attorney.